Elderly Care Memphis TN – What Are Activities of Daily Living? 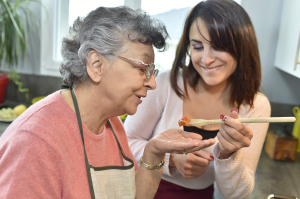 Whether you have been caring for your elderly parent for years, or you have just started your caregiver journey with them, one term that you are likely to have heard is activities of daily living. Also referred to as ADLs, these are a measure of how functional your aging loved one is. You can think of these as the tasks that your parent must go through each day as a part of regular living. Difficulty fulfilling these due to challenges and limitations is often why caregivers seek out care for their aging parents. Understanding ADLs, what they are, and how an elderly care provider can help your parent manage them can help you to make the decision that is right for your parent regarding their future care. There are two basic categories of ADLS. These are referred to as activities of daily living and instrumental activities of daily living. Activities of daily living are the most basic and fundamental of these tasks. They are the tasks that young children often begin to learn as they explore their independence and are an important element of functioning and thriving. If your aging parent struggles with any of these ADLs, it is important to take the steps to help them manage them in ways that are right for them. This can include you providing direct assistance, making adjustments to their surroundings, and starting elderly home care for them that will address their challenges and limitations to help them remain as independent, active, and fulfilled as possible as they age in place. Starting elderly care for your aging parent can be one of the best decisions that you make for them during the course of your caregiver journey. An elderly home care services provider can be in the home with your parent on a fully customized schedule to ensure that they have continued access to the care, support, and assistance that they need to live their highest quality of life. A highly personalized set of services will be tailored specifically to your parent’s needs, challenges, and limitations to ensure that these are met and addressed in the way that is right for them. This care provider will help them to manage these needs while also encouraging them to live a lifestyle that is as active, engaged, and independent as possible throughout their later years. As a family caregiver this will give you peace of mind knowing that your parent will have everything that they need to live a happy, healthy, safe, and fulfilling life as they age in place. For Elderly Care Services in Memphis TN, please contact the caring staff at Personal Care Services MidSouth today! This entry was posted in Elderly Care Memphis TN, Personal Care Tips and tagged Elderly Care Memphis TN. Bookmark the permalink.